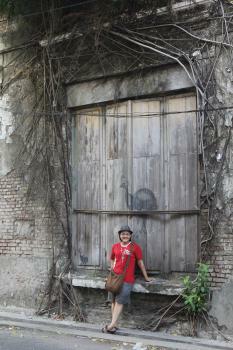 Semarang Old Town is part of the Tentative list of Indonesia in order to qualify for inclusion in the World Heritage List. Visited November 2018. Semarang would be a very valuable addition to the WH list. The city is located on the north of central Java and is easily accessible from different places on the island. Although the old town (Kota Lama) looks a bit ruined and some buildings are in a very bad condition, you can find there a kind of atmosphere that makes you want to stay longer. Just walk around, you’ll discover what makes this city special – some old Dutch architecture, small streets with galleries and shops, a bit forgotten Chinatown… Not to miss old churches, Chinese temples and, a bit further from the center, very big Lawan Sewu that used to be the headquarters of Indonesian railways and colorful Kampung Pelangi. According to what I’ve learned at the tourist information center (or tourist agent), the biggest values of the city is a chance to follow the trade and industrial history of it; when you know where to go, you’ll surely appreciate that. And some best cafeterias in Indonesia! Semarang is the capital city of Central Java, and it is not hard to get there from Jakarta. A 40 mins flight or 6 hrs train ride will get you to there. The location of the Kota Lama (Old Town) is not far and quite central. The area covered is not that huge and some buildings worth seeing is not that many as well. I have to say that some serious things need to be done in order to preserve the area. 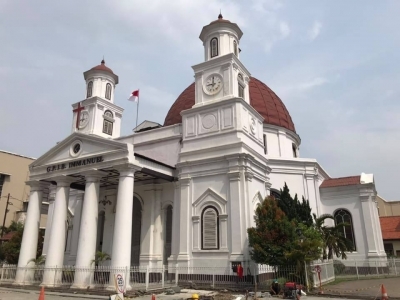 The one that is the icon of the Old Town, and also the icon of Semarang City itself is the Church (Gereja Blendhuk) in the central of the area. It is still operating, I even went there for a Sunday mass. Some old buildings still leave the 'colonial feel' when seeing them, some restaurants nearby also keep the 'old time look and feel' to the patrons. Hope they keep it up..